Illinois pols gave government employee unions the key to the vault and the state is now bankrupt and without a plan. John Kass has a modest proposal for what to do next. Dissolve Illinois. Decommission the state, tear up the charter, whatever the legal mumbo-jumbo, just end the whole dang thing. We just disappear. With no pain. That’s right. You heard me. The best thing to do is to break Illinois into pieces right now. Just wipe us off the map. 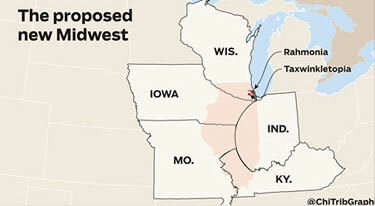 Cut us out of America’s heartland and let neighboring states carve us up and take the best chunks for themselves. The group that will scream the loudest is the state’s political class, who did this to us, and the big bond creditors, who are whispering talk of bankruptcy and asset forfeiture to save their own skins. But our beloved Illinois has proved that it just doesn’t deserve to survive. So why not let our friendly neighbors like Indiana, Wisconsin, Iowa, Missouri and Kentucky just take the parts they want? As you can see by the excellent “Kevorkian Illinois” map that accompanies this column, this plan is visionary. The alternative is hell. Illinois hasn’t had a state budget for years. The state continues to spend money it doesn’t have, and the state’s credit ratings have dropped, increasing the cost of borrowing more money we don’t have to keep the rotten shebang going. Since our neighboring states are doing better, taking Illinois jobs and businesses and Illinois workers and taxpaying families, they might as well just take the rest of Illinois, too, dammit. Naturally, Chicago Mayor Rahm Emanuel will fight this. He needs a job. And he’ll most likely beg his friends at The New York Times and the Washington Post to write angry editorials to save him. And these will be full of concern for the republic and those dispossessed Midwestern salt-of-the-earth taxpaying Americans, as if. If there are portions of Illinois that the other states don’t want, they may be left as federal territory, a wilderness where only the strong survive and peasants and friendly propagandists kneel and beg for crumbs. 4 Feedbacks on "Partitioning Illinois"
Democrats never have an incentive to constrain their destructive economic policies. They understand (correctly) that future administrations will clean up their mess — usually long after they’ve moved on. For example, exactly NONE of the Democrats who created an actuarially unsound Social Security system are here to atone for it. LBJ and friends are not around to see the welfare culture their Great Society has created and how it has destroyed black families. Exactly right. A recent article pointed out that the average pay for a city worker in NYCity was $140,000 while the average pay for all civilian workers in NYCity was $50,000. I am sure that Illinois does the same thing. The worst thing we can do is bail them out. Don’t do it because there are a dozen states on the verge of following Illinois and it is simply impossible to bail them all out. Let them go bankrupt, fire workers, restructure and suffer the belt tightening and fight their way back. A good lesson for other states. I like it, but there’s one thing you left out: If the people who created the mess are allowed to, they will re-enter politics or political life somewhere and do it again. Everyone who has been in, been associated with, or received remuneration from any government, in any capacity, from any government entity in Illinois must be subject to a lifetime ban on being involved in any government entity or activity in the United States. Their involvement with government must be limited to voting as individuals in whatever district they reside and are legally registered as legitimate voters. Allowing them to do anything else regarding government guarantees a repeat performance wherever they wind up. We in Wisconsin totally REJECT THIS IDEA. WE DO NO WANT ANY PART OF CHICAGO.